Guide for the hero Ormarr, a character in Arena of Valor (AoV). Included are Ormarr’s abilities, statistics, attributes, strengths, weaknesses, and more. 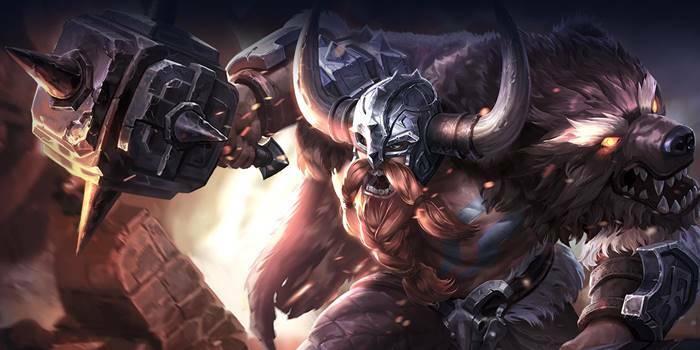 These are Ormarr’s attributes on the mobile version of Arena of Valor. Click here for his attributes on the Nintendo Switch version. Ormarr dashes forward and enhances his next normal attack to deal 150/200/250/300/350/400 (+1.15 AD)ˀ physical damage and knock the target into the air. Skill affects all enemies struck by basic attack splash. Attack amplification disappears after three seconds. Critical damage is only applied to Ormarr’s base AD. For example, a normal (200% damage) critical hit on a level 1 Unstoppable will deal 2AD + .15AD + 150 damage. Ormarr bashes the ground with his hammer, dealing 215/260/305/350/395/440 (+1.05 AD) physical damage to enemies within range and reducing their movement speed by 50% for 1 second. Each cast that hits 1 or more heroes grants Ormarr a stack of fighting Spirit. After reaching 3 stacks, the next cast will trigger Gut Punch. Grants stacks of Fighting Spirit no matter the enemy type. Ormarr swings his hammer in a circle (he is able to move while doing this), each hit dealing 100/120/140 (+0.5 AD) physical damage to enemies nearby. His health is also restored by 2% of his max HP for each enemy hero hit (up to 6% at any given time). This ability cannot be interrupted but can be affected by movement debuffs. He can also use Unstoppable while spinning. Ormarr’s passive triggers randomly, but it is extremely powerful when it triggers. Swagger triggers the same stun effect and damage bonus as Ormarr’s passive every 4th time it deals damage, so take advantage when you know these effects will trigger on the next use. Our recommended order for Ormarr’s abilities as he levels up. See all of Ormarr’s item builds.